For me the story of Pinocchio is an allegory of mistakes and consequences related to this. The main character of a story is Gepetto who is an old,worthy craftsman who happened to make a mistake - he creates Pinocchio! The doll is not similar to the image of its creator. Gepetto creates a monster like Dr Fankenstein did. Gepetto created the puppet as a better reflection of himself. But Pinocchio is a symbol of lies, laziness, shortcuts, disrespect, aversion, stupidity - just evil! In my opinion Pinocchio does not feel good with himself.I used this theme in my painting. 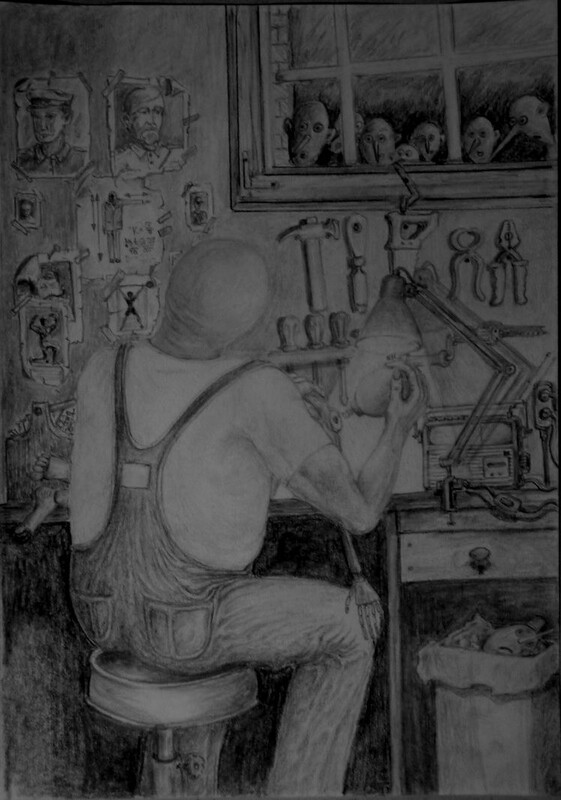 The main character of painting - Gepetto is changing the head of the doll - to will be similar with his The puppet's old head is in the trash.Puppeteer creates something which is consistent with his nature.He did not embellish or diminishes.He decides to take this step after many attempts.Old Dolls - they are looking through the barred window - are concerned about is what will happen to them.Gepetto carefully and lovingly is working on a new doll.It is not known what will be the result of his work but we know that their previous attempts were not successful.On the wall we see portraits of old, timeless-values.Perseverance, strength, honor, heroism, logic - tired and old, they look at Gepetta strengthening him in his work.I wanted to tell a story about people being in compliance with themselves. In a human life we should not pretend to be someone else and we should express what we have inside us! own head.